Thinking about starting a new business? Stop! Is there a genuine market for your idea? Do you really want to compete in that industry? Are you the right person to pursue it? No matter how talented you are or how much capital you have, if you're pursuing a fundamentally flawed opportunity then you're heading for failure. So before you launch your lean start-up, take your idea for a test drive and make sure it has a fighting chance of working. 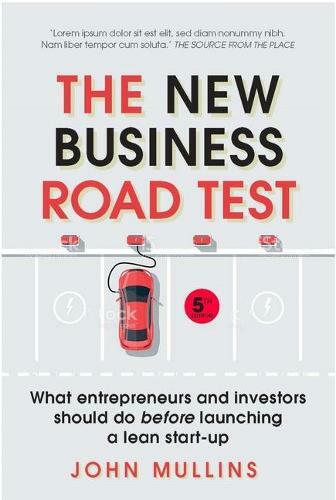 Now in its fifth edition, The New Business Road Test is the essential handbook for anyone wanting to launch a start-up. The new and fully updated case studies - Ella's Kitchen, Whole Foods, eBay and more - and 'seven domains' framework will help you avoid impending disaster and enhance your chances of achieving your entrepreneurial dreams. * Are the market and industry attractive? * Does the opportunity offer both customer benefits as well as competitive and economic sustainability? * Can you deliver the results you seek? "Mullins has hit the nail on the head. I wish this book had been given to every entrepreneur who appeared before me on Dragons' Den." - Doug Richard, entrepreneur, angel investor and founder, School for Startups.